Not quite 1,000 rounds through the gun this week due to the Phoenix Aim Fast, Hit Fast travel. The goal of getting some good, benched groups with the Asym Ammo last week fell through. Apparently, the NRA Range bought new pistol rests (Delta Rests) but failed to fill them with sand. This makes them all but impossible to use, and attempts to wring maximum accuracy out of the gun just weren’t happening. I spent literally hours cleaning the gun and soaking the barrel for this test, and it was all for naught. I also put a replacement o-ring on the barrel. My plan was to compare before and after groups, but as I said the groups just weren’t consistent enough to draw conclusions. The class in Phoenix went very well (read some AARs here). We had a couple of celebrities in class, including Mark Garrity of Garrity’s Gunleather (maker of the In-Victus AIWB holster I wear daily) and Tom Jones of 365 Days of Training. While I fired less than 250 rounds over the weekend, the sand, dust, and grit on the range left the HK45 clearly worse for wear. It never missed a beat, though, even when the slide felt like it was rubbing two pieces of sandpaper together every time it cycled. No surprise, given the intensely hostile operating environments for which it was designed. In fact, the gun turned in some great times. My best F.A.S.T. for the class was a 4.80 (clean) at the end of the weekend. We also ran Triple Nickel, my demo scored a 4.74 with all shots not just in the bottle but inside the 8″ target circle… which is why I do the double-Fonzie at the end. Completely forgot about the reload until the gun stopped working, though, can you tell? The area where I’m really noticing a difference in performance is SHO and WHO at speed. I shot a few students’ 9mm pistols and compared to them, I felt my demos with the HK45 one-handed were slow and not as accurate as I’d like. With only a few weeks of testing left, if I’m going to get that stuff up to speed — literally — I’d better put some more focus on it. nah, bring on the M&P45 mid-size! Todd – somewhat off topic but HK related…did Scott Warren ever “go final” w/ a version of his sights for the HK P30? Screw that I’ve got .50AE Desert Eagle and a nice leather concealment holster (from a movie no less) that Todd can use for his next test. I expect to see 1000 round test days too. But I ain’t supplying the ammo dude. something I noticed in this video and I’m not sure if it’s just because of the reload after thought, but is the wiggle to dump the mag something you are doing more often now? I noticed it a few times when you were up here, it’s like the mags don’t drop free as quickly as you’d like? Nice shooting on the “Triple Nickel” Todd. I’m still working with this drill and having a Blast. I like your website. 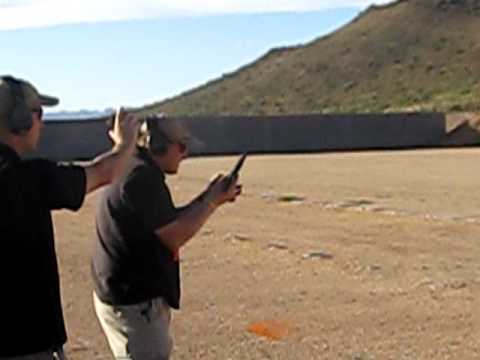 Here is a short video of me shooting it with my Sig P220 .45. ARRGH!! New to the video link thing. What kind of holster are you using in the appendix style carry? Andy — I’ve primarily used a Garrity In-Victus with the HK45.